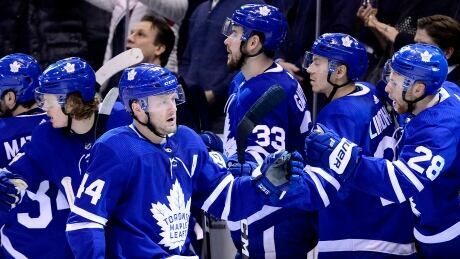 Morgan Rielly scored the winner midway through the third period of a back-and-forth game as the Toronto Maple Leafs edged the Ottawa Senators 5-4 Wednesday night. Rielly started the rush after a Sens turnover. After racing up the ice, he passed to Zach Hyman, whose backhand pass found Rielly alone in front of the goal for his 14th of the season at 9:12. It was also Rielly's career-high 53rd point of the season. The Sens piled on the pressure with the goaltender out but could not score. Trailing 2-1 the Leafs scored three goals in four minutes late in the second period to pull ahead. Auston Matthews, fresh off news of a contract extension, scored what had looked to be the winning goal at 3-2 while Mitch Marner set up two others to press his case for a lucrative new deal. But Ottawa pulled even at 4-4 early in the third on goals by Thomas Chabot and Magnus Paajarvi, his second of the night, in a stretch of three minutes 19 seconds. Toronto (33-17-3) won its third straight and fourth of its last five (4-0-1). The Senators (19-29-5) suffered their fifth straight loss. The Leafs came into the game flushed with news of Matthews' $58.2 million US, five-year contract extension. "Welcome home Auston," said one sign in the stands. "Drink$ on you?" Matthews opened his NHL career against the Sens on Oct. 12, 2016 at Ottawa where he set a league record for goals scored in an NHL debut (4). Hyman, Andreas Johnsson and John Tavares also scored for Toronto on Wednesday. Matt Duchene also scored for Ottawa. Marner, the Leafs' leading scorer with 65 points, upped his assists total to 45. It was his 14th multi-assist and 20th multi-point game of the season. The 21-year-old winger, who is eligible to become a restricted free agent July 1, is next on GM Kyle Dubas' to-do list. Toronto coach Mike Babcock has no doubts it will get done. "Mitch is a lifetime Leaf," he said after the morning skate. Ottawa has contract questions of its own. Duchene, Mark Stone and Ryan Dzingel are all eligible to become unrestricted free agents on July 1. Senators owner Eugene Melnyk says he is prepared to open his wallet. According to a club release, Melnyk told a Sens corporate event Tuesday in Toronto that the team's "current rebuild is a blueprint on how to bring the Stanley Cup home to its rightful place in Ottawa." He pledged the team will spend close to the NHL's salary cap every year from 2021 to 2025. The Battle of Ontario was a mismatch looking at the numbers. Going into play Wednesday, the Leafs ranked sixth in the league. Ottawa was 31st, some 24 points below Toronto. But Ottawa had won six of its last seven visits to Scotiabank Arena. It was Craig Anderson versus Freddie Andersen in goal. Ottawa's Anderson was playing his 599th NHL regular-season game. The Leafs started on time, outshooting the Sens 8-1. Anderson had to be sharp on several occasions, kicking out a pad to rob Nazem Kadri some seven minutes in. But the Leafs went ahead when Marner's pin-perfect pass eluded a sliding Sens defenceman and Hyman tapped it in at 7:46 for his 10th of the season. Ottawa rallied after the goal and Paajarvi, taking a stretch pass from Jean-Gabriel Pageau at the Leafs blueline, split the defence and beat Andersen with a wrist shot on the glove side to tie it at 17:18. Shots were 11 apiece after 20 minutes. Ottawa's shot No. 12 was reviewed after it went through Andersen's legs and seemed to dribble over the line early in the second period. But Andersen's right leg was judged to have knocked the puck back before it completely crossed the line. There was no doubt in Duchene's 22nd goal of the season. After a Leaf turnover, Bobby Ryan sent the puck in from the corner and it deflected off Andersen and a Toronto defenceman to Dzingel who slipped it to Duchene. The star centre waited for Andersen to move and fired it in at 1:35. Toronto then killed off a four-minute Jake Gardiner penalty for high-sticking Zack Smith, who was cut on the lip. Andersen, sliding the other way, made a remarkable stick save off a Colin White backhand later in the period after the puck deflected back off a Leaf defenceman's stick. Johnsson played poacher at 14:20, taking a puck that came off the end board and beating Anderson with a backhand to tie it at 2-2. Johnsson was coming off a four-point night (two goals, two assists) in a 6-1 win Monday over Anaheim. Matthews put the Leafs back in the lead, dragging the puck past a sliding defenceman only to lose the handle. When Pageau couldn't control it, Matthews got the puck back and poked it in for his 24th of the season at 16:29. Marner was the provider again, outwaiting defenceman Ben Harpur to fire a perfect pass for Tavares to tap-in for his 32nd of the season at 18:20. Ottawa outshot Toronto 16-12 in the period. It was NHL game No. 500 for newly acquired Leafs defenceman Jake Muzzin, who has won over fans in Toronto with his physical play and booming shot.